Erasmus+ is the EU Programme in the fields of education, training, youth and sport for the period 2014-2020. The Erasmus+ Programme is designed to support Programme Countries' efforts to efficiently use the potential of Europe’s talent and social assets in a lifelong learning perspective, linking support to formal, non-formal and informal learning throughout the education, training and youth fields. The Programme also enhances the opportunities for cooperation and mobility with Partner Countries, notably in the fields of higher education and youth. Programme countries: EU countries, Macedonia, Iceland, Liechtenstein, Norway, and Turkey. Erasmus+ studies are an opportunity to study in one of the VGTU partners universities, receiving an Erasmus scholarship from 300 EUR / month to 500 EUR / month. The duration of study abroad under the Erasmus+ program consists of 3 to 12 months; mostly mobility lasts one semester, the duration of which varies from 3 to 6 months. Students could participate at the Erasmus + studies programme more than 1 time. Studies abroad are recognized by VGTU - this means that after the returning to VGTU there is no need to pass exams which were passed at VGTU partner’ university. Students could participate at Erasmus + studies at 2nd year of undergraduate (bachelor) studies, and apply for that on the first year of undergraduate studies. How to participate at the Erasmus+ studies? Every VGTU student has such a right, but for that students should participate at competition for studies in one of VGTU partners’ universities under the Erasmus + programme. Student status does not change during the mobility by Erasmus+ studies programme. to apply in February for Erasmus+ studies exchange for the next academic year’s autumn or spring semester optionally. The selection consists of the following stages: submission of an electronic application (in manovgtu.lt system), the priority line formation according to each faculty selection criteria, selection interviews at faculties, and announcing of results. PK – 1 additional score provided for students who participate first time in studies exchange programme. The receiving partner - higher education institution must be chosen from the list. Please note that each faculty of VGTU has its own partners list! You can choose up to 3 partner institutions. Before you fill the application and apply for a scholarship, you must find out the offered courses (and credits) at partner`s home website and have a consultation with your Faculty Erasmus coordinator about the suitability of courses to your study programme. After the application deadline you will get an e-mail with invitation to an interview which will be the deciding point for granting the scholarship. Sampling results are public and could be found on official VGTU website. The selected students should start their preparation of the application documents for submission to the VGTU partner’ university to which student won competition on study exchange. By Erasmus+ studies exchange programme minimum mobility duration is 3 months. Amount of Erasmus+ studies scolarship is calculated by multiplying number of months by fixed amount of scolarship for particular country (see table below). If mobility duration covers not full month(-s), scolarship amount for these days calculated by multiplying number of days by 1/30 of fixed scolarship per month. 80% of scolarship is provided to student in the beggining of Erasmus+ studies (till first study day at VGTU partner’s university), remaining 20% of scolarship is provided to student after settling up for studies*. *other conditions are applied by Erasmus+ World agreement. *Scolarship partially covers travel, insurance and viza expencies. Programme countries: Belarus, Chile, Egypt, Jordan, Kazakhstan, Morocco, Serbia, Thailand, etc. The receiving partner - higher education institution must be chosen from the list. Scholarship of 650 EUR/month + lump sum for travel is provided. To measure the distance the Tool of European Commission is used. 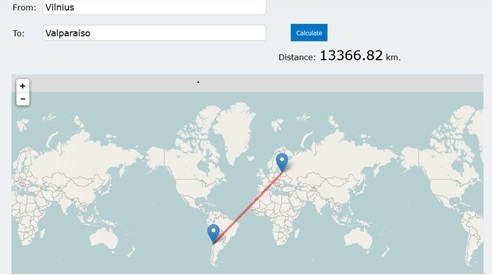 For example, choosing studies in one of VGTU partner‘s higher education intitution in Chile, 1100 € lump sum for travel expences will be provided (see distance calculation below). There should be kept in mind that lump sum for travel expences will be provided only by Erasmus+ World programme variation.